THE WILL OF JOHN BUTTERFIELD. dated February 8th 1849. This is the last Will and Testament of me John Butterfield, Woolcomber of Fearnincliffe in the Parish of Bingley and County of York. Twenty-one years then, if living, be paid to her in full; but in case she die previous to her attaining the age of Twenty-one years, then and in such case, I Will and Direct that the legacy be equally divided amongst my two sons and three daughters; but in case any of them be dead too, then in such case the money be given to his, her or their children (if any) in the same manner as his, her or their parents would have received it, if living at the time. And lastly I appoint my dear wife Rebecca Butterfield and my nephew Benjamin Butterfield of Bingley in the aforesaid County of York to be the Executrix and Executor. Executor of this my last Will and Testament, written on the two preceding side of this sheet of paper. In witness whereof I have hereunto set my hand this Eighth day of February in the year of our Lord One Thousand Eight Hundred and Forty Nine. 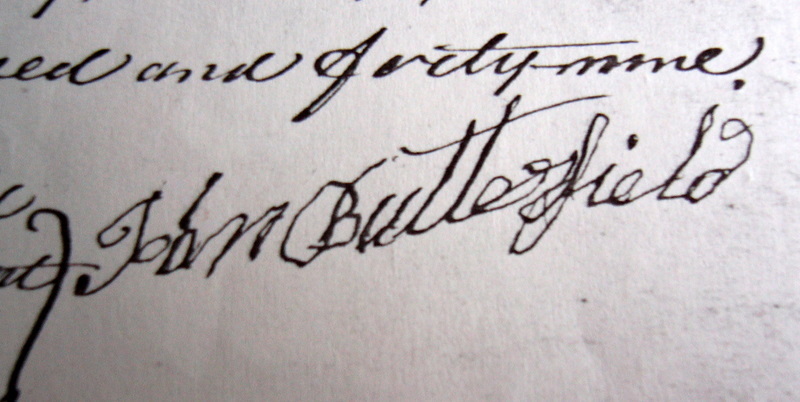 Signed by the said John Butterfield as and for his last Will and Testament in the presence of us, who at his request, in his presence, and in the presence of each other, have hereunto set our names as witnesses all at the same time. The will is dated February 8th 1849. John died on March 21 1849, and although mentioned in his will, Rebecca died a week earlier on March 14 1849.